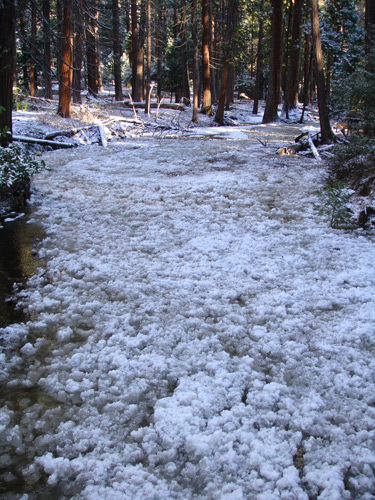 In the late winter, early spring, the water in Yosemite Falls can become super cooled and form small ice crystals that turn Yosemite Creek into a beautiful flowing slushie. I’ve been living in Yosemite for 6 years, and it’s the first time I’ve actually gone to Yosemite Creek when it was cold out and seen it. When I confessed to a long-time Yosemite resident, he responded, “Glad you are enjoying your stay here in beautiful Yosemite National Park.” which I read with a saccharine tone. But it is so true in some ways. All this time, and I’m still a tourist – still seeing new things and being amazed. I’ve had people ask me if there is enough to see in Yosemite to spend 3 days here, and just now I saw something that it’s taken me 6 years to actually see. I guess that would be an emphatic ‘Yes’. After I got back, I was telling everyone, and Tom also ran out to see the ice. When he returned, he called and commented, “I see you your frazil ice, and raise you one bobcat”. There’s so much to see in Yosemite. When I first got to the trailhead, the ice was starting to back up and come to a stop. 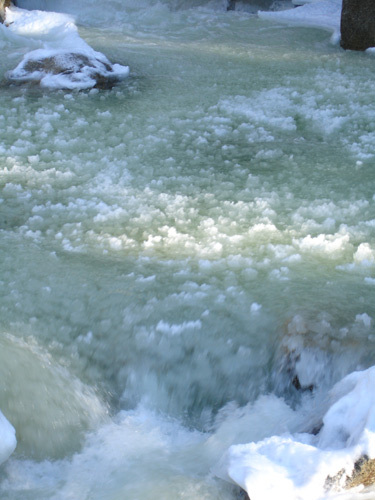 I guess if it was colder, and more of the frazil ice had formed, it would have backed up the river and caused the banks to overflow. According to the NPS site, it does this on a semi-regular basis – covering trails and causing damage to bridges and sometimes even buildings that used to sit next to the creek. In 1997, the frazil ice built up to the point where it nearly covered the Lower Yosemite Falls bridge – coming up over the railings. That must have been incredible to see. PS. Quick note: super cooled frazil ice this morning, but tomorrow’s forecast is for a high near 60 degrees. The weather here has been absolutely schizophrenic. Sure makes things interesting. I saw this as I was headed to the food court on bike. It makes you stop and look.